Where one great turn…leads to another! 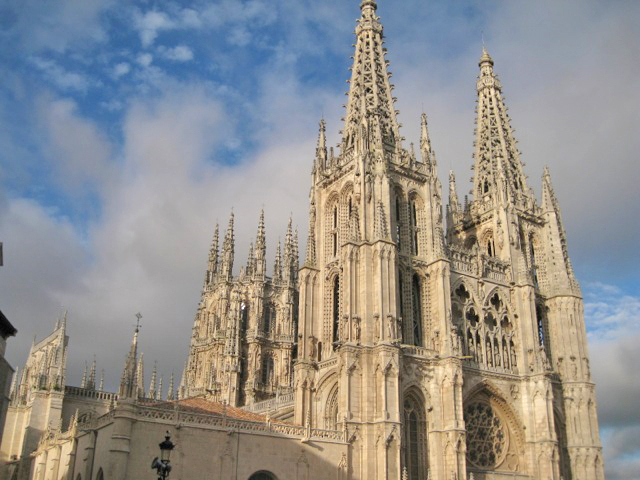 “A pilgrimage to Santiago de Compostela is the finest journey in Spain,” wrote James Michener in his book Iberia. Plenty of city, church, and cultural sites on tour. The road from the French border across the top of northern Spain to Santiago de Compostela was one of the three major Christian pilgrimage routes during the Middle Ages, all leading to the resting place of the Apostle St. James. Winding from the Pyrenees to the gently rolling fields and woods of Galicia, this ancient system of trails and roads is now the most popular long-distance trail in Europe, renown for its stunningly varied landscape, its ancient villages, beautiful meadowlands, rolling hills, the famous vineyards of the Rioja region, and a treasure trove of historical sites, churches and cathedrals, religious art and some of the most extraordinary architecture in the western world. Add to this the wonders of such beautiful towns as Pamplona, Burgos, Leon and the wondrous city of Santiago de Compostela, and you have a magical and fascinating tour indeed. “Rosita was right to tell you that we enjoyed the tour! We not only enjoyed the Camino de Santiago Tour, we were delighted with it. We are aware this tour is different from the many other Bike Vermont/Discovery Bicycle tours that we’ve been on over the past ten years, but it was supposed to be and we thank you for offering it. Don’t get us wrong, the high standards that we’ve become accustomed to with your company were there: superior lodging, excellent food, beautiful scenery, historic sites, and–of course–knowledgeable, affable, and do-anything-for-you guides. What was unique about this tour was the Camino itself and the route that pilgrims (including us) travel across northern Spain. More typical tours tend to stay somewhat local, often with two nights lodging in the same inn, and days get filled with riding, sightseeing, and finishing with time to visit local towns. We thoroughly enjoy this type tour. But on the Camino this scenario was not always possible, nor should have been, since we choose to experience the Camino as other pilgrims do. 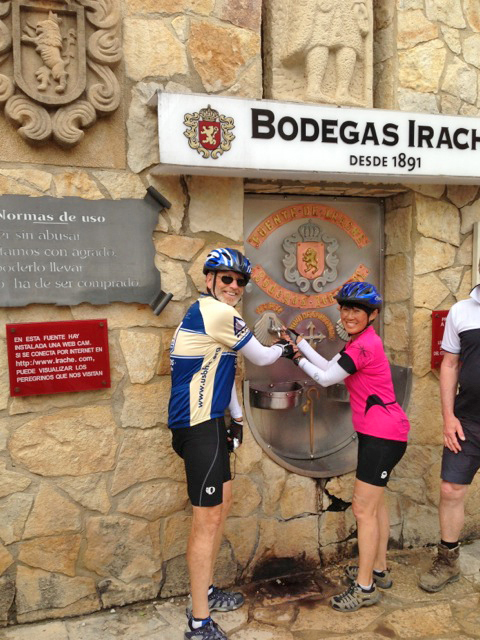 Our tour was about riding the Camino de Santiago–either as a pilgrimage, for its culture, or just for sport–so naturally it required variance from some of those “standards”. We had a 500 mile point-to-point destination, so that meant one night at each hotel and travel periods in the van. The time it took to ride each day varied because we stopped to get our pilgrim’s passport stamped, to eat and snack, to visit and photograph interesting sites, but most significantly because we rode on the walkers’ trails which slowed the pace. These were the options we took. We sat longer, talked to other pilgrims, and opted for the paths rather than the pavement. Were we challenged at times? Absolutely. Hills were steep and the trail rough sometimes. But we were surrounded by people who were challenging themselves to months of walking, or by bikers who had ridden from their homes in Ireland and the Netherlands. This was our Camino first and foremost, and it was our experience as much as the pilgrims’ traveling with us. 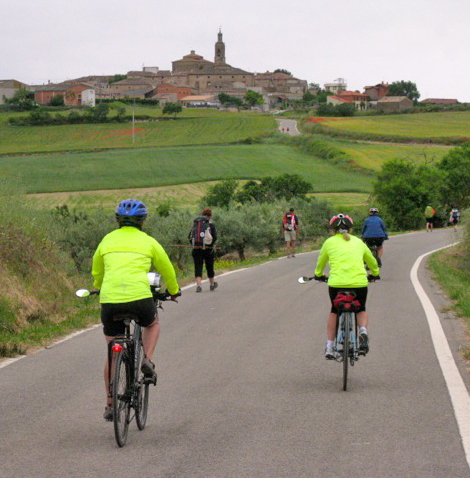 In other words, the history and heritage of the Camino superseded the idea of an ordinary bike tour, and made it extraordinary. We expect this is why you and Rosita took the time and resources to offer this tour. Our group at pilgrim landmark where two caminos merge. Meanwhile, our group of five got very close. We laughed and labored together. Arriving in Santiago, we knew we had accomplished a wonderful trek with Rosita and Damiano serving as our guides. They were a great team. We were so lucky to have them lead us on this tour. We highly recommend it for those who look upon the Camino de Santiago as a special journey. Vicki and I hope that your other clients will have this opportunity as well. It’s a trip of a lifetime filled with a lifetime of memories! 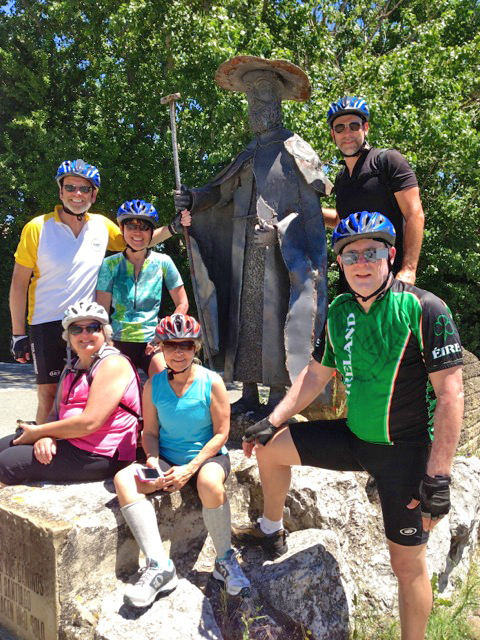 Discovery Bicycle Tours will be offering the El Camino de Santiago 10-day/9-night tour again in 2014. Free wine for pilgrims. Help yourself!! 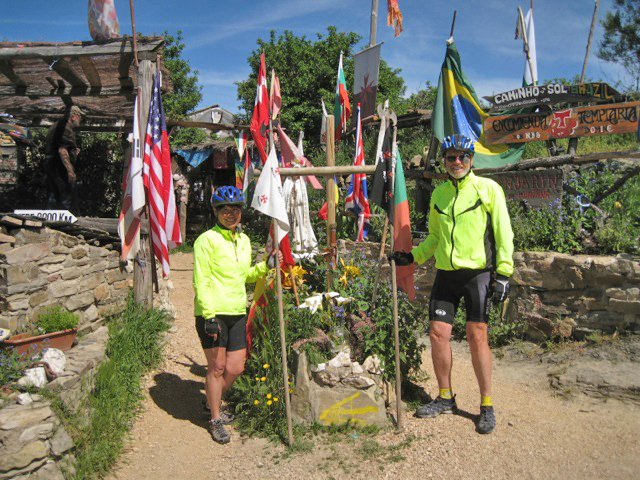 This entry was posted in Spain Bicycle Tours and tagged adventure, bicycle, bicycle tours, bicycling, bike, bike touring, biking, Camino, cycling, Discovery Bicycle Tours, El Camino de Santiago, Galicia, inn-to-inn bicycle tours, Middle Ages, pilgrimage, Pyrenees, Santiago, Santiago de Compostela, Spain, St James's Way. Bookmark the permalink.